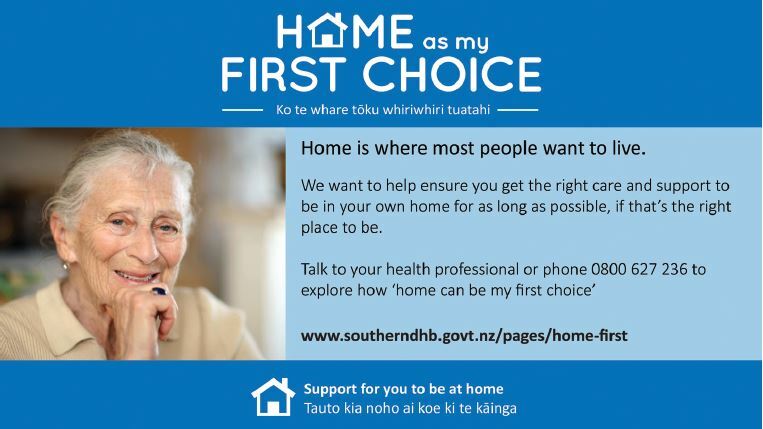 The ‘Home as my First Choice’ programme was launched by Southern DHB in April to raise awareness of support options available when an older person wants to either stay at home, or return home from hospital. It helps to ensure people get the right care and support to be in their own home for as long as possible, if that’s the right place for them to be. A new ‘Home as my First Choice’ webpage has recently gone live for older people and members of their family/ whanau to access lots of useful information about the programme and support available in the community. As well as a former patient Daphne telling her story about being supported to remain at home after having a stroke, the page also has a community resource section. “The community resource section has everything in one place ranging from information about shopping, meals and transport to companionship services,” says Sally O’Connor Directorate of Nursing, Strategy, Primary and Community.